Massaged kale, what!? You’ve got to be kidding me right? You massage your kale? Yes, gentle readers, I most definitely massage my kale. 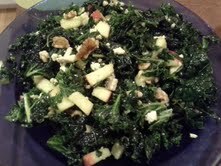 Actually, I’d do anything for my kale, because it’s my favorite food and I’m unabashedly in love with it. Kale is a superfood. It is in good company with other superfoods such as salmon, walnuts, berries, pumpkin, brewer’s yeast, oatmeal, spinach, quinoa, beans, and sweet potatoes to name a few. Superfoods are nutrient-dense foods bursting with vitamins and minerals that can positively impact your health. Studies have shown that kale in particular, lowers cancer risk for at least 5 different types of cancers; specifically bladder, prostate, ovarian, breast and colon. It has the most micrograms of vitamin K per cup of any other food in the food chain. It is rich in omega 3’s and possess 45 different flavinoids, which act to detoxify with anti-inflammatory and anti-oxidant benefits. A nutrient-dense powerhouse, it’s no small wonder why it isn’t a staple at every table??? 1/4 C gorgonzola, or more! 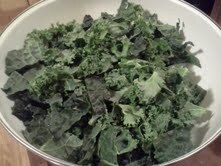 Start with a LARGE bunch, hopefully more of washed, dried and chopped kale. It can be any kind: leafy, curly, lacinato– you pick. I like to do a combo of whatever I have. Pluck or slice the leaves from the fibrous center ribs, (and feed the ribs to your dog). 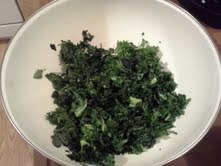 Sprinkle the salt atop of the kale and massage for around 2 minutes or until the pile is reduced by 1/2 to 2/3 the size. (If you don’t work with greens often, a tip is to have way more than you think you could ever eat, because they shrink dramatically). Add the apple, walnuts, cranberries, and sunflower seeds. Add the oil and vinegar. Start with the lesser amounts and toss. If needed, add more oil and vinegar to taste. (It is hard to be exact when I don’t know exactly how much kale you have. You want it lightly coated, not dripping). Add the gorgonzola and enjoy! I encourage you to be creative with this recipe. The kale is a starting point. Some ideas I’ve had is to do an Asian-themed kale salad with mandarin segments, sliced almonds and sesame seeds with a honey, ginger and soy dressing, or an Italian-themed kale salad with grape tomatoes, balsamic vinegar, fresh basil and fresh mozzarella balls. I have also served the above recipe with homemade smoked salmon pieces and with salmon in general as a main dish, for a quintessentially Northwest recipe with local, sustainably sourced ingredients. Kale fans, I know you’re out there, so speak up! Share your favorite variety or recipe, (or questions) in the comments below. I like to slice my kale into short strips, and then toss it with carrots and cabbage for a slaw. It’s especially delicious with either a mandarin dressing or a teriyaki, mayo(alternative) dressing. Yummy!! Yum! That sounds so good. I think you just talked me into massaging my kale!! How long will this keep in the fridge? Can I make it today and eat it for lunches all week? I think the salad is better the next day 🙂 I’m sure it would be fine for all week, but I can’t testify because it doesn’t last that long around here! Maybe just leave the cheese out and add it as you eat it??? Yum! I love kale 🙂 I just ordered a new variety from Seed Savers Exchange! Thanks for sharing this on Wildcrafting Wednesday!